Ben Richards is a major TV name in Britain who has distinguished himself across a range of musicals, including Grease and Guys and Dolls to The Full Monty and Priscilla, Queen of the Desert. He can currently be seen at the Dominion Theatre opposite star Beverley Knight in a fresh run of The Bodyguard, the stage version of the iconic 1992 film that starred Kevin Costner in the title role of Whitney Houston's minder. The delightful Richards took time one recent afternoon to chat about takeovers and conquering the Big C in an honest and wide-ranging interview. 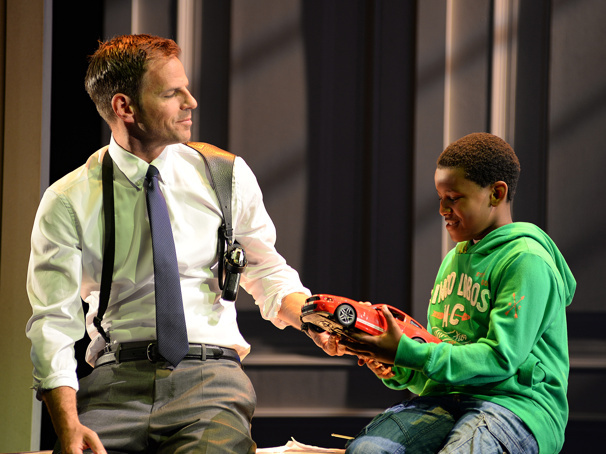 You're the latest in a strong line of actors to play the title role in The Bodyguard on stage: what has that been like? What's interesting is that I accepted [the part of] Frank on the strength of the script and what I had heard, which is probably a bit of a gamble. Otherwise, there can be that element of watching someone's performance and then you try and copy it, whereas I try to inhabit the role without any outside influences. Frank Farmer is an unusual part for a musical theater performer given that he has next to nothing to sing. Yes, and when you do hear him sing, it's very badly in the karaoke scene! In some ways what's weird about The Bodyguard is that for most of the characters it's like a play. It's when you have the concert numbers, with Beverley as Rachel Marron, that it becomes a musical. So you don't have to worry about your voice? It’s so nice not to have to do that. The thing with Frank is that the part is about being grounded; he's the anchor of the piece. It's important, too, in a show about an entertainer that Frank isn't Mr. Showbiz. He looks after big people, and he's prepared to take a bullet on the job. You make the interesting point that the 1992 Kevin Costner film doesn't at first glance suggest itself as a stage musical. Not the way that, say, when you see Moulin Rouge, you think, "I can see how they would put it on stage." But what's really clever about the way [director] Thea Sharrock has done this is that the set is like an iris: it moves in and out and helps direct your eyes to where she wants you to watch. So in a way it manages to be theatrical and cinematic at the same time. Do you think attracts people who don't necessarily go to musicals? Or theater shows of any sort, much like when I did Rock of Ages. These sorts of shows encourage people who don't normally have a night at the theater because, at least in the case of The Bodyguard, everyone knows the songs. I saw the movie when I first started going to the cinema and have been singing and dancing along to Whitney Houston ever since. Do you relate to the world of the show—that's to say, of intense celebrity and the need for bodyguards that goes with that? Well, the first thing to say is that Bev [Knight] understands it completely as a recording artist and star and knows what it's like, at least to a certain level. And though she herself doesn't live like that, she knows the terrain. I've found for my part that I'm not very interested in the media circus where you end up going to the opening of an envelope. I'd much rather be around friends and do normal stuff or be here in the country [in Hertfordshire, north of London] with my family. That's what keeps me sane. You're no stranger to takeovers. The result has allowed you a broad range of parts. That's the intention. I want to be as chameleon-like as I can be, whether that means playing a gay drag queen in Priscilla or a 1980s misogynistic boss [on tour] in 9 to 5 or a shaven-headed thug in Oliver! or a rock god in Rock of Ages. What's good is when the work keeps changing: the goal with each project is to switch it up. You've been very candid about having had bowel cancer and subsequently became an ambassador for Bowel Cancer UK. By the time 9 to 5 came along, I had finished treatment and knew I could do [the show], so they were, like, "OK, we trust you to do your thing." It's been four years now since the diagnosis, and I feel fantastic; a fifth year in the clear will be the big marker. This must give you a new and considered perspective on life. Very much so, and I'm always aware that things could have gone the other way. You learn for one thing to take less for granted. But I find more than ever that I like where I am going and I'm very happy. We're scheduled to do The Bodyguard in Toronto in the first half of next year, for instance, and I'm incredibly excited about that. I'll get to do my American accent in North America. That should be cool. And what about once you're back in the U.K.? Well, there's certainly a big buzz about this Hamilton show, but I don't know if there are any white guys in it.